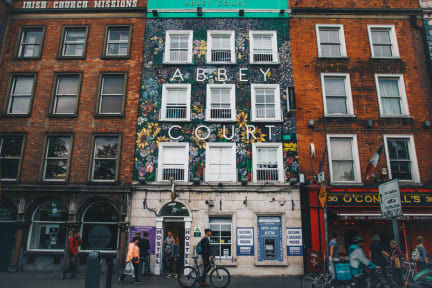 The Abbey Court, part of 'Dublin's Best Hostels', is famous for its excellent location, brilliant facilities, warm atmosphere, friendly staff and competitive prices. The hostel has been operating successfully since its establishment in 1999, and continues to see thousands of satisfied guests coming and going year after year. With en-suite dormitories ranging from four to twenty-four beds, the Abbey Court is known for its excellent group catering facilities. Rates include bed linen, as well as free towels for guests staying in single and twin rooms. Despite our central location, guests are still assured of a comfortable and peaceful night's sleep, allowing for a full and busy day ahead. Check out our list of free stuff for all guests: all-you-can-eat breakfast, luggage storage on arrival, laptop and passport storage, lockers in the dorm rooms (bring your own lock! ), Wi-Fi and Internet, maps and city guides, a self-catering kitchen, and best of all, free guided walking tour of the city every morning. We also run an infamous nightly pub crawl. We've got hot water, power showers and extra showers and toilets on each floor, plus laundry facilities and a smoking area. We have 24 hour reception so there's no lockout or curfew. There's also 24 hour snacks and drinks and our lounge, games room and TV room are open all the time. Located just off Dublin's famous O'Connell Bridge, we are the most centrally located hostel in the city. Temple Bar, Ireland's famous cultural corner and nightlife spot is a two-minute walk away and can be seen from the front windows. We're just minutes from all the major places of interest and shopping areas including Dublin Castle, Christchurch Cathedral, Trinity College, the Guinness Storehouse, Grafton Street and Stephens Green. Also within walking distance are the tram stop, the DART station and many bus routes that will take you to more scenic areas outside of Dublin including Howth, Dun Laoghaire, Bray and Dalkey, plus the main sporting and concert arenas. Our fun and friendly staff are on hand 24 hours to give advice and recommendations on the best restaurants, pubs, shopping areas and tourist attractions, and also to point you in the right direction of all the hidden gems you wouldn't discover otherwise. Excellent location, very comfy bed and decent breakfast included in the price. I stayed here only for 1 night and REALLY liked it. I had a great night sleep, relaxed to the sound of a water fountain out of the dorm window after arriving knackered at 1am. Very helpful staff, chilled friendly VIBE among travelers, surrounded by cool artwork on the walls! Clean, safe, top facilities, stylish. I just needed a place to crash for the night but would certainly return and highly recommend to anyone! Loved this hostel. Great vibes. The murals on the wall were awesome. I slept in a 12-bed room which was a little tight but for the cost, it makes sense. Big lockers under the bed. En-suite bathroom was clean. Good breakfast. No complaints. The Abbey Court is central to Dublin, everything is within walking/bus distance. The room accommodations were exactly as advertised, and were clean and comfortable. Abbey staff could not have been more friendly or helpful, making our first trip to Dublin easy to navigate. Street noise can be an issue if you are a light sleeper, but exactly what was expected for downtown Dublin. Would absolutely stay again! I stayed here last year and knew that I had to come again. I have a bad knee and they placed me on the third floor, so that was a bit daunting. The breakfast is one of the best free ones you’ll find in Dublin. Depending on how many beds are in your room, and with the luck of the draw who you get, will make or break your stay at any hostel. People might come in the middle of the night and turn on the lights without a care, but you signed up for the low price, am I right? The hostel itself was nothing exciting, but it was in a good location and provided a good place to sleep. The staff was great and I loved that there was a bathroom off of the bedroom. However, the communication from the hostel initially about check in time was not clear, and we were left without a place to go for several hours. We checked our bags at the front desk and they gave us tickets, but the staff let us collect our own bags without checking and that felt very irresponsible. This hostel has probably seen better days. Dorms were a bit old and the common area was also quite dated. Breakfast was very good and the location is fantastic. This brings in a much younger crowd which also causes the volume to be extremely loud do to the immaturity of some people. Wish i never went here. The rooms are a lot smaller than what the pictures show. It’s cramped and impossible to sleep when the lockers have to be scraped across the floor in order to get them out. The staff had no clue what they were talking about when they recommended places to go to because each time the recommended place was closed. It was off putting and felt out of control from how many people were in the hostel. Beds were uncomfortable and the ONE pillow they gave us provided no support.